As you must already know by now, Dania Furniture tried their damnedest to fleece me into paying $75 for non-guaranteed delivery. I spat spiteful words and warned them that I would show them what $75 can do. I was launching an internet revolution against them and there was nothing they could do about it. Subsequently, the I has become we, and we have done much to show them how much pain the I went through and that we are going after them. In other words, we needed to employ a creative marketing solution directed at Dania that would articulately and reasonably communicate the value of $75...for $75. We simply needed to teach them a lesson. Enter Google Adwords, which offered to sponsor our advertisements for this blog, and awarded us $75 worth of free advertising budget. The type of advertising we employed was search engine marketing (SEM). This method of marketing displays ads on Google.com (the sponsored listings at the top of the search results and on the right hand side) that are related to the searches made by Google users. I'm sure you've seen them, even if you've never clicked on them. These ads enable advertisers to purchase website clicks/traffic to their page, based on keywords (words users search with) they believe to be relevant to their website. 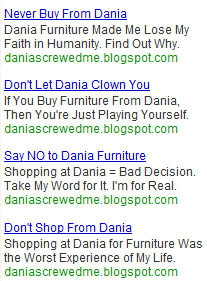 In other words, I used this Google grant to drive users to my page that are searching for Dania Furniture. Here are some of the ads we ran; you may have even clicked on one! Lots of Visitors. We attracted nearly 300 visitors to this blog solely through these advertising efforts. People Loved Our Ads! Over 3% of all searches that loaded our ad received clicks (that's called a click-through-rate or CTR). On average a 1% CTR is considered good, although this will vary based upon business vertical and marketing objectives. People Loved the DSM Experience. On average, each user spent 3 minutes on the page and visited almost 3 pages at a time. 26% of these users even came back at least one more time! Now, That's Just Hilarious. What we think is coolest is that our ads sat right next to Dania Furniture's official website. If you're not familiar with SEM, it's an effective marketing strategy that captures users near the end of the proverbial sales funnel. These users who are searching for specific information about a company to purchase and/or acquire information on products/services are likely to be influenced by the information they receive. In other words, effective SEM strategies can influence users/shoppers by providing them with information and details they need to make an informed shopping decision. We didn't have a trackable goal, like the sale or inquiry of a product/service, so there wasn't a quantitative method of evaluating the success of these advertising campaigns. However, we believe that our unique, organic message without any clear, distinguishable marketing goal resonates with people. We don't exist to sell you things or peddle goods...we simply just want you to know what you need to know: Dania Furniture is terrible. Numbers be damned! This blog is all about heart, passion and soul...nothing Dania would know or understand. This isn't the last time we will be using Google to advertise for the blog, and we firmly believe we can improve upon the quality of advertising. Currently, our Adwords campaigns have an overall quality score of 8.5/10 points, although it is not currently active. With the Dania ScrewedMe Page 1 Party coming around the corner, however, there may be reason to do so. Who knows what kind of advertising we'll ever decide to do...you might hear us on the radio or see a commercial on TV about us.